Okay, I made these using a "Mother (J).nes" rom, so I hope that's the one you're playing. Couldn't find a one-code way of doing this. Note that these codes seem to cause some glitches in certain text boxes (like the Game Over text) and I have no idea why. The game seems to generate a pseudo-random number after every step you take (but also at other times, it seems) and then checks to see if that number is less than some other number, which I call the "encounter rate" for lack of a better name. There is a small table of encounter rate values and I'm assuming the value used depends on the area you are in, but I didn't look into that part of the code too much. These codes will hard-code the encounter rate to a fixed value. And then one of these codes. A lower number means less random encounters. (00) means no random encounters, although if that's what you wanted then I could probably do that with less than three codes. As a frame of reference, the area just outside of Ness's (Ninten's?) house is using (13), and it looks like the toughest areas would be using (32). is that with the first code will never produce random encounters while the second code will almost never produce random encounters? You said you could probably produce a code that turns off enemy encounters completely in less than three codes? Please see about that. This is exactly what I'm after, as long it doesn't affect scripted encounters (such as the lamp battle at the very start of the game) or encounters you seek out (such as the doll battle also at the start of the game). No random encounters would be EZVOAINP. but the ROM size is only 0xA00F (including the 16byte header). So how do I alter the adress which is out of the file size? Thanks! UglyJoe can you please, make a code for loopy smb2j so you 7 or 8 stars at title screen? thanx. This one is a bit weird. There are three places in the game's code that check the "how many stars should they have" byte (which is stored as the first byte in the SRAM at 0x6000). VXEGZGAV - The "functional" code. This one will give you 24 stars, but you don't see them on the title screen. If you hold down A when you press start, though, you'll be in World A.
VZUYXZAV - The "cosmetic" code. This one will light up the title screen with 24 stars, but as far as I can tell it's just for looks. VXXKYIAV - The "mystery" code. This modifies part of the game code that looks at the "stars" byte, but I have no idea what it does. You can use them in any combination that you want, as they should work independent of each other (except maybe the third one, since I don't know what it actually does...). I figured 24 stars was better than 7 or 8, but if you specifically need 7 or 8 stars there, I can come up with codes for those, as well. May I jump in with something different? The ONLY difference is at h9B6F where the first one has hEF and the second [alternative] has h6F. What does this difference do? It's definatelly nothing obvious because I can't tell from playing those two versions for some time. Maybe it's just some mistake that occured during dumping the pirate rom, and maybe it doesn't affect gameplay at all. Can this be discovered by any mean? Thanks! When you're looking for small changes like this based only on a single address, the first thing to do would be to determine if it's program rom or character rom. A quick glance at the rom in a tile editor shows that the address 0x9b6f is part of the CHR-ROM, so it's just a graphical change. 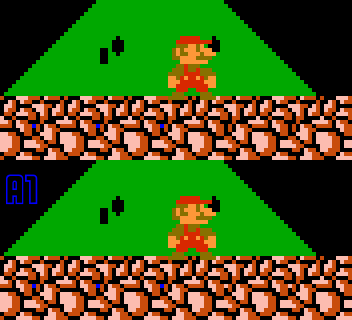 The difference is a single pixel in part of the stone floor graphics, as shown below. I've marked the different pixel with a blue pixel so it'll stand out better. You can see after I stop marking it that it is indeed a different color between versions. Wow you really ARE a genius Joe! Thanks! I would have never found out what's the difference, and it would bother me for a VERY long time! I would say that the A1 stone texture version looks a little better than the first one, but it's such a small diference that I actually think it's only a mistake. And a mistake that got an [a1] tag and it's spread over the internet. Also great job on the stars-code for loopy's SMB2j! Always appreciate a new code for my repro! UglyJoe, thanx for the codes. i tested them on a real nes. VXEGZGAV - The "functional" code. It works, but the game freezes sometimes. for exemple when i was at the end of world A-1, or when i paused the game in A-1 to go for a smoke. It's random. i don't know if it's a bad connection between the nes-game genie-game, or maybe the rom, or even the code. VZUYXZAV - The "cosmetic" code. - This code didn't worked. if you please, can me make a code to have 7 stars. why 7? because i want to make another cart whit the code patched in the rom. and that way you can acces world A-1 only when you finish the game one time. it's not important if the star are visible or not at the title screen. Would have been helpful to know this at the beginning! So you don't really want 7 stars, you want to be able to get to World A after beating the game only once. Those are two different things. I can make a code for that. sorry for not telling you. a code like you said would be perfect.